I have heard other people say before what a pain it is to get little kids to brush their teeth. I've heard parents complain about being bit, tantrums and lots of wiggling during teeth brushing sessions but honestly, I didn't have anything to relate it to. It wasn't until I took my girls to the dentist for the first time a couple of months ago that I realized that maybe my kids were in the minority of little ones who don't mind having their teeth brushed. The dentist wasn't too surprised that my 3 year old sat pretty still and thought she was big stuff in the chair, but he seemed overly surprised that my then 1 1/2 year old didn't mind it. He had her straddle my lap, and then he laid her backwards with her head in his lap. He asked me to try to hold her still and gave me this little pep talk about how she would probably hate it and he would be quick, etc. When she opened right up and just laid there, letting him brush, he continued to comment on how he had never had another one that age sit so contently. I'm not saying this to brag, but just to share some of the ways we have been able to brush our girls' teeth without a battle each day. Start young I think one common mistake is waiting until the child has a full set of teeth and at a dramatic point in childhood to start brushing their teeth. It's a foreign object in their mouth and they aren't in control of it...of course they will be surprised. Start as soon as the first tooth pokes through. You can get little baby tooth brushes that you put on your finger until they are ready for toddler size. Be consistent This one is probably really obvious, but toddlers need consistency. If they know that every morning after breakfast or before their nap, their teeth are getting brushed, they will be prepared for it and may not fight it as much. Try to stick to your routine as much as possible. For us, it is after breakfast and before bed at night. Let them brush yours Our kids love brushing our teeth. We often brush ours at the same time and they just think it is the best thing ever to get a turn brushing ours the way we brush theirs. Take turns When we first started, we would brush their teeth thoroughly first, and then let them have a turn playing with the brush and "brushing". Now, we let them have their turn first and "brush" their teeth (they are actually getting pretty good at it now), and then they pass it over to us for a turn. We have done it this way so long, that I give them their toothbrushes while I'm brushing mine and before I'm even half way done, they are passing me theirs and saying "your turn, mommy". It really helps kids to know they have some control over what you're doing to their body. Assign words, songs or fingerplays We have a little routine and words to go along with it. First, they open up and say "ahhhh" so their mouth is wide and I can get their bottom teeth. The I tell them I'm going "upstairs" and they say "ahhh" again and I do their upper teeth. Then they give me a "cheeeeeeese" and I do their front teeth. They know the routine well and tell me to do the same when they brush mine ;) They also love singing the Brush Your Teeth song by Raffi occasionally while we are brushing. 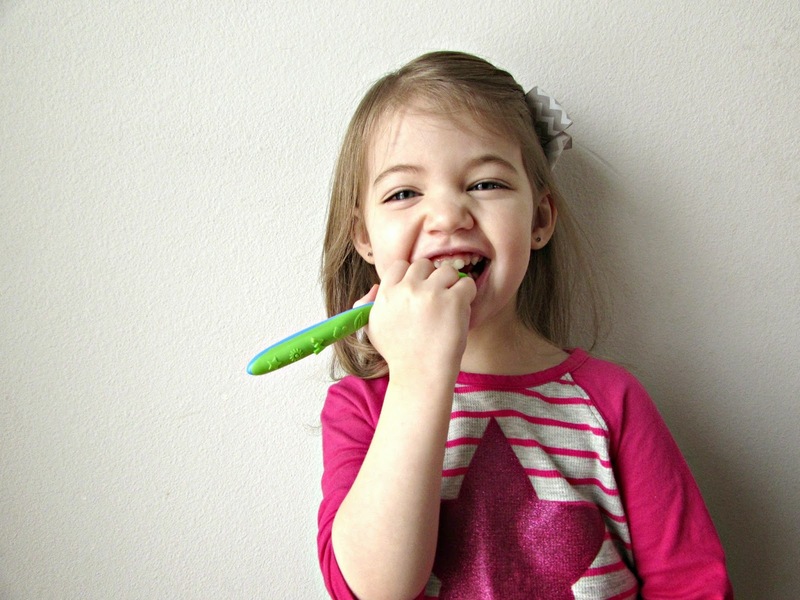 Finger plays, songs, and rhymes about brushing your teeth are all great for kids. Show them pictures or videos Sometimes one of the most effective ways you can get kids to do something they don't want to is showing them other people doing it. 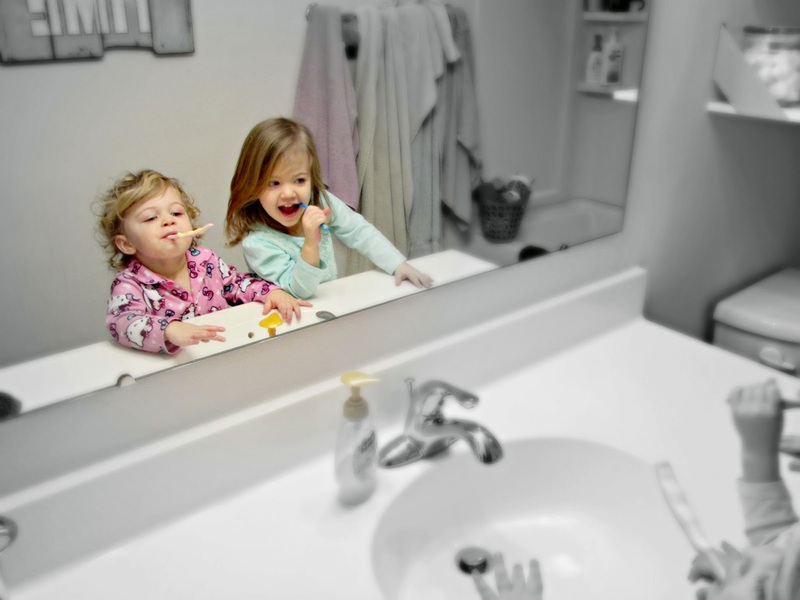 If they really look up to older kids, show them a picture of some bigger kids brushing their teeth. If they love Mickey Mouse, try to find a video on YouTube of Mickey brushing. Once they see that everyone does it and its "cool" they may be more willing to give it a try. Have you faced the tooth brushing battle in your home? 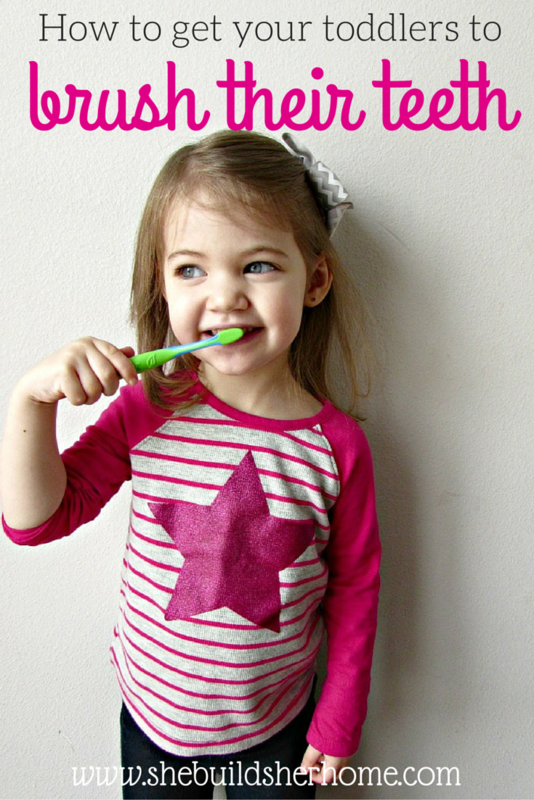 What are some tips you have for getting your kiddos to brush?